Leominster quarterback Noah Gray and coach Dave Palazzi open their season against a young Doherty squad. Welcome back to the high school football season, everyone! It’s time for some fun under the Friday night lights. To start our season here at SuiteSports, we have our first Game of the Week. Leominster makes the trip to Worcester Friday night at 7 pm for what could end up being a fairly defense-heavy game. The game will be played at Foley Stadium, and here's what you can expect from the Highlanders and Blue Devils. 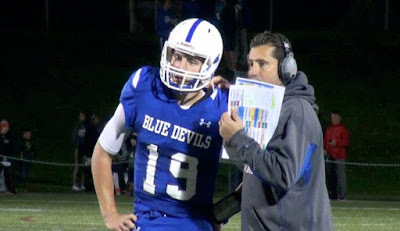 Despite both Leominster and Doherty seeing success over the last few seasons, capped by disappointing playoff losses last year, their current situations are quite different. Leominster enters Friday’s game with a plethora of returning players, many of whom are seniors. The Blue Devils, of course, have a stellar quarterback in Noah Grey. Although losing some major play makers at wide receiver, the backfield is still loaded behind a real tough offensive line. On the other side of the ball, the Blue Devil front seven led by senior linebacker Anthony Dandini. That group could emerge as the most dangerous component of this team. As for Doherty, this is a young squad that has yet to discover its true identity. Although riddled with talent and a winning pedigree, the Highlanders don’t have quite the starting experience along the lines as their opponent this week. That being said, don’t sleep on them. Doherty’s strength for years has been speed, and this year will be no different. The secondary is young, but they can fly. A veteran linebacker corps anchors this defense, and will definitely be the key for Doherty to control this game. On offense, a quarterback tandem might rotate situationally, meaning Leominster will need to be prepared to face two very different style offenses. Although the consensus here at SuiteSports is that Doherty enters the game as an underdog, don’t think for a second we are counting them out. Expect to see Leominster lean a little heavily on the run game. The Blue Devils’ offensive line matches up well against a smaller Doherty line, and may be a safer bet than challenging the speed of the Highlanders’ secondary. Doherty might need to load the box a bit heavily on Friday night though, so corners Tajon Vassar and Gabe Mangrum need to be prepared to accept the challenge of one-on-one coverage with little safety help. On the opposite side of the ball, anticipate some diverse looks from Doherty. The Highlanders can’t be too predictable on offense, or it may be a long night trying to pound through a physical Leominster front seven. That being said, some speedy pass catchers and an explosive running back may spread the defense enough to keep the Blue Devils out of Doherty’s backfield. Be sure to check back here at SuiteSports after the game for a full recap.